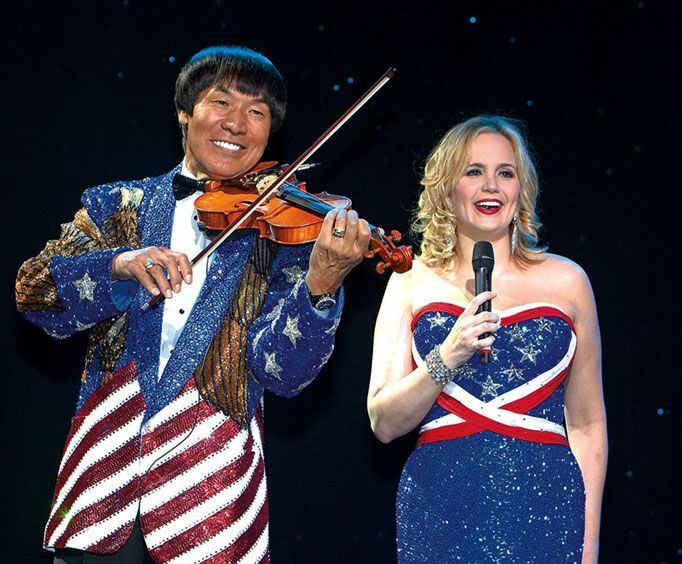 Catch Shoji Tabuchi as he brings his violin with him to the Branson MO stage to delight with his famous show. Along with his wife Dorothy, and daughter Christina, this family truly embodies the talent and showmanship qualities that make it an outstanding, worry-free vacation in Branson MO. This high-quality show promises top-notch performances that cover a wide variety of musical genres from classical, American country music, gospel music, 50's and 60's hits, and for fun, they even throw in some current selections. 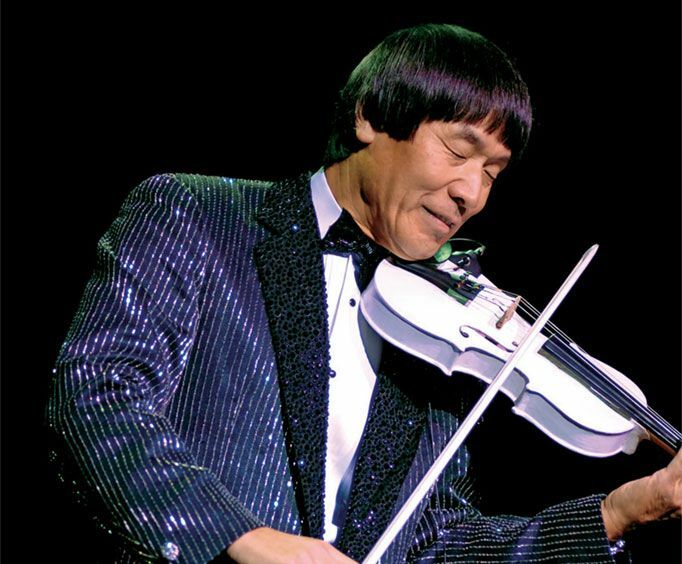 Shoji, a world-class violinist, has comprised a huge band of some of the most amazing professional musicians from around the world, and nearly every member holds at least one degree in music. Dorothy has worked with some of the best choreographers to showcase an elite group of dancers with dance routines that are truly a work of art. You'll see rope twirling cowboy numbers and polkas, to name a few of the treats. The show rivals any you would find on Broadway. At the Shoji Tabuchi Show, Dorothy is responsible for the choreography and has successfully produced an elite group of dances that help create a visual for the musical tracks and bring pure excitement to the audience. Throwing some extra treats into the production, you'll also see cowboy ropes twirling, Taiko drums performances, and Christina singing vocals that will seem to stop time for a split moment. Born in Japan and hailing from Daishoji’s Ishikawa prefecture, Shoji Tabuchi began learning the violin at only 7 years old. He got inspiration from American Country Music, and he even met American music star Roy Acuff in Osaka. By speaking with Acuff at the backstage area at his concert, he was able to get the inspiration and push he needed to move to America and begin his cross-country journey playing music concerts around the US. With an expansive career and tons of talent, he went on to play at the Grand Ole Opry just like Acuff. In 1980, he built his very first theater in Branson, MO. From there, he went on to create a show that Branson locals and visitors love, with nearly 30 years of amazing performances under his belt. The Shoji Tabuchi Show currently plays at the Clay Cooper Theatre. This is a great multi-million dollar theater in Branson that is known for an amazing array of music concerts and other events. The theater is beautiful and immaculate, allowing guests to enjoy their shows in a comfortable theater with expansive seating and a quality sound and lighting system that truly brings the performances to life. As well as the Shoji Tabuchi show, the Clay Cooper Theatre houses the Clay Cooper Country Music Express, The Haygoods, Hot Rods & High Heels, and the #1 Hits of the 60s show. Come see why this theater is one of the best in Branson by catching one of the awesome shows here. Get one of these awesome concerts tickets now. Enjoy a relaxing Branson MO vacation with the Shoji Tabuchi Show. This amazing performance allows guests to enjoy the best of Ozark Mountains music on a beautiful local stage. These concerts have everything from country to gospel and is sure to impress. Approximately how long is the Shoji Tabuchi Show? The Shoji Tabuchi Show is approximately 2 hours. Totally loved the show. We took a trip to south dakota and met other fans of this show. Everyone i have ever spoken to and mention shoji's name has always raved about how great an entertainer he is and what a wonderful show. I especially love that he has a live band. They add so much to the overall effect. So many people now only have canned music. I was so blessed with the entire program. I like that he involves the audience and band members in his routine on stage. What an entertainer. I'm planning to return again this christmas season. We were in branson for the roy rogers round-up and most of the activities we participated in were at their museum. We had one time slot to fill with something else and chose shoji tabuchi. It was most enjoyable, unbelievable talent and performance beyond expectation. Tabuchi-san is a very humble performer and very appreciative of his audience. There was so much to see and hear in only 2 hours. This was our 2nd time to see this show, and we loved it even more than the first time. There is such a variety that everyone should find something to love about it. I loved seeing christina so involved in the show, and her singing was very good. She was about 9 or 10 when we were here last. She sure grew up to be a very lovely young woman. The extras in the show are great and trained very well. So much goes into the production of every segment of the show, and i can't wait to see the christmas production. Loved the bathrooms. They are something to see. Thanks to all involved in helping the ladies out with so much space. Loved everything about the show--even shoji's humor. Liked it better when not christmas show.